While not national capitals, several cities across the Alps qualify as cultural capitals of the region. Zurich, Innsbruck, Salzburg, and Munich are a hop and a skip from each other, sure. But anyone who has heard Swiss German—which developed poles apart over centuries from the closely related Austrian and Bavarian dialects—will soon realize that despite modern transportation and mass media, these cousin cities still maintain their own distinct cultural traits. A four-day Alpine Capital tour offers a greater diversity of experiences than you might initially expect. 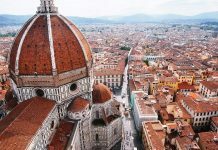 All these cities, however, do share some things in common: You’ll find well-preserved historic buildings, superb museums, and beautiful green spaces. 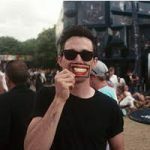 Each city embraces the spirit of the famously untranslatable word Gemütlichkeit, a welcoming friendliness which you may experience on a summer’s evening drinking wine in a courtyard garden, or in the fall in a wood-paneled restaurant as you dine on speckknödel, Tyrolean smoked bacon dumplings. 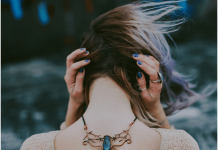 You’ll bask in the well-honed hospitality skills of your hotel and restaurant staffs, and appreciate the crisp attention of the bakery or wine shop owner who, no matter how busy they may be, takes the time to greet you as you enter. For a major city, Zurich is surprisingly compact, with an eminently walkable Old Town and delightful trams that make exploring easy. At the Widder Hotel, off of the famed Bahnhofstrasse, the thick, exposed lobby beams speak to its centuries-old pedigree. Equally historic, the Hotel Adler lies right off the Limmat River in the pedestrian-only Old Town. To start your explorations of Zurich on a full stomach, head first to Zunfthaus zur Waag, a restaurant in the opulent former guildhall of the city’s weavers. It’s a popular place to try one of Zurich’s most famous dishes, Zürcher Geschnetzeltes, a veal ragout dish in a mushroom cream sauce. With works by favorite Swiss son Alberto Giacometti and a large collection of works by Edvard Munch, the Kunsthaus Zürich, which first opened in 1910, is soon to expand to include a brand new wing. Next to the train station in its own park jutting into the Limmat River, the Swiss National Museum just expanded with a contemporary addition to its historic structure filled with archaeological and historical displays. 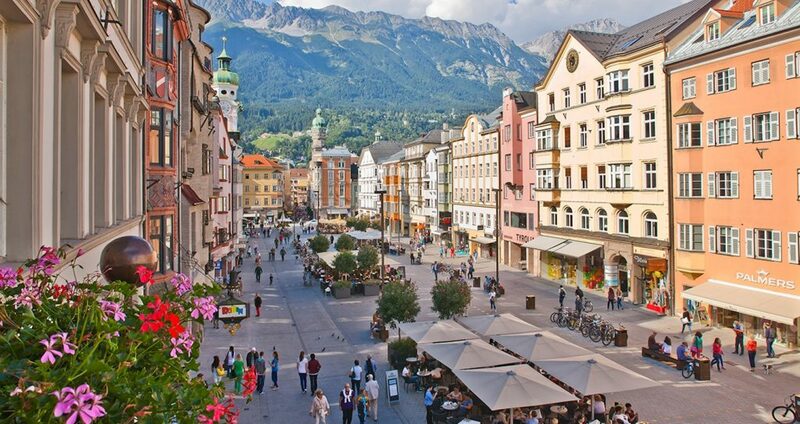 Put on the world map by the 1964 and 1976 Winter Olympic Games, Innsbruck is often called the Capital of the Alps by its inhabitants. In recent years, the late architect Zaha Hadid elevated the city’s stature in the design world with her stunning Hungerburg funicular stations that lead up to the Nordkette Mountains that look over the city. An old 1950s inn recently turned trendy, the Nala Hotel promises wonderful views of those mountains as well as the Stubai Alps to the southwest. In the old town’s pedestrian-only zone, guests sleep snug in the modern urban rooms of the Hotel Weisses Rössl. As you plan your meals, the laid back and unpretentious Die Wilderin restaurant is known for its fresh, locally sourced ingredients. Serving breakfast and pastas, the small Cafe Immerland is a popular stop with locals, while the Soulkitchen offers healthy brunches. Right on the Inn River, the Hofgarten Park, with a palm house and café, is centuries old. Just across the street by the university, the Treibhaus music and cultural center caters to all generations. Of the city’s two iconic sites, the hilltop Ambras Castle has protected Innsbruckers for almost five hundred years, while the old town’s Golden Roof of the same era was built to protect Emperor Maximilian I and his bride. From the oriel underneath the gilded copper tiles of the roof, they could observe celebrations, tournaments, and gatherings in the town square below. Tip: Don’t leave Innsbruck without sampling Tyrolean speck, a favorite local dish of beechwood-smoked ham flavored with herbs and spices. 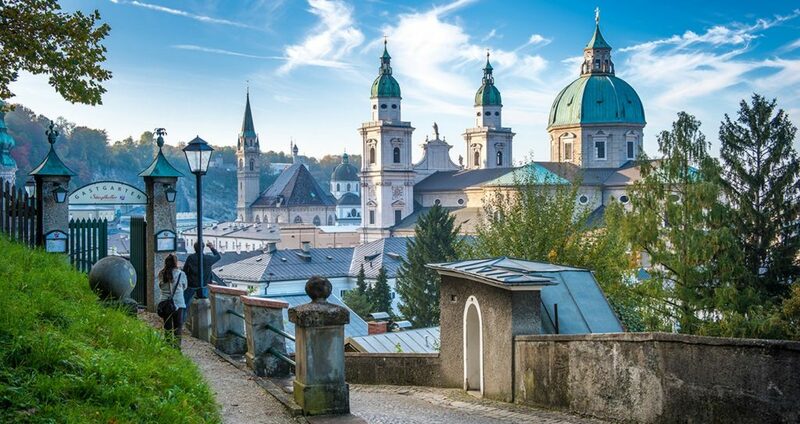 As you wander its medieval and Baroque streets that helped earn Salzburg the honor of being a UNESCO World Heritage Site, you may feel like you have wandered into a dream. But the city is more than a gorgeous museum piece, continuing its role as one of Austria’s cultural capitals that dates back to the days of Mozart, who was born here. 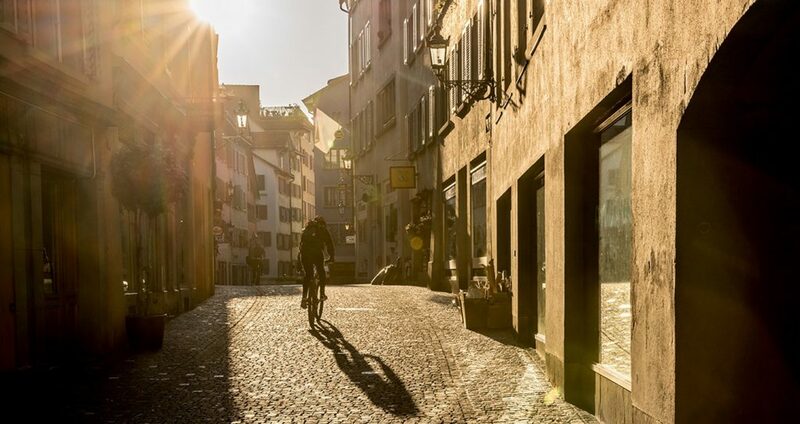 Just down the celebrated Getreidegasse from the house where Mozart was born, the Arthotel Blaue Gans (Blue Goose) is located in an historic townhouse, but its interiors are thoroughly modern and filled with contemporary art. Its Gewölbe restaurant has an ancient vaulted ceiling, creating an unforgettable setting for a meal. In another 14th-century house, the Cozy Hotel Weisse Taube (“white dove”) is a casual property just off the Mozartplatz. Serving tafelspitz and goulash, Zum Fidelen Affen is a celebrated traditional dining establishment, while the 220 Grad Café (grad means degrees) serves light fare with their own roasted coffee brews. 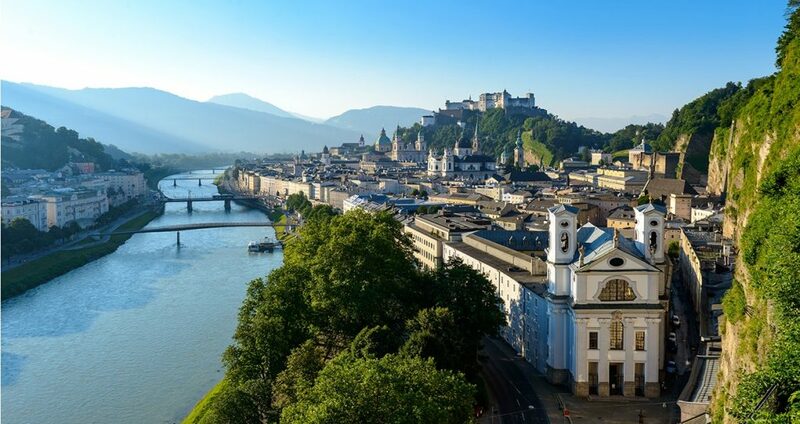 Two of Salzburg’s iconic sites lie on either side of the Salzach river: With a rich museum collection of historic artifacts, Hohensalzburg Castle looms over the old town; the Mirabell Palace with its stunning Marble Hall and formal gardens lies on the left bank. Tip: Make admiring the city’s landmarks a delicious experience by picking up some Mozartkugeln-chocolate balls with pistachio centers-to snack on as you wander among the Baroque masterpieces.